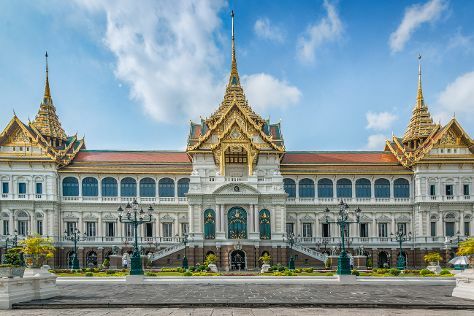 On the 14th (Sat), step into the grandiose world of The Grand Palace, take in the spiritual surroundings of Wat Pho, then take in the spiritual surroundings of Temple of the Emerald Buddha (Wat Phra Kaew), then admire the landmark architecture of Jim Thompson House, and finally buy something for everyone on your list at Siam Paragon. Get ready for a full day of sightseeing on the 15th (Sun): hunt for treasures at Chatuchak Weekend Market, then relax and rejuvenate at some of the top local wellness centers, then stop by Playn Eyewear, and finally take in the spiritual surroundings of Temple of Dawn (Wat Arun). For where to stay, traveler tips, other places to visit, and other tourist information, read Bangkok tour planner. Washington DC, USA to Bangkok is an approximately 31-hour combination of car and flight. Traveling from Washington DC to Bangkok, you'll lose 12 hours due to the time zone difference. Plan for much hotter temperatures traveling from Washington DC in January, with highs in Bangkok at 88°F and lows at 71°F. Finish your sightseeing early on the 16th (Mon) to allow enough time to travel to Krabi Town. Start off your visit on the 16th (Mon): enjoy the sand and surf at Ao Nang Beach, then tour the pleasant surroundings at Phra Nang Beach, and then stop by King's Fashion. Keep things going the next day: tour the pleasant surroundings at Nopparat Thara Beach, tour the pleasant surroundings at Khlong Muang Beach, then trek along Railay Beach, and finally take some stellar pictures from Railay Beach Viewpoint. For where to stay, maps, reviews, and tourist information, refer to the Krabi Town custom trip planner. Getting from Bangkok to Krabi Town by combination of train, flight, and bus takes about 4.5 hours. Other options: drive; or do a combination of taxi and bus. 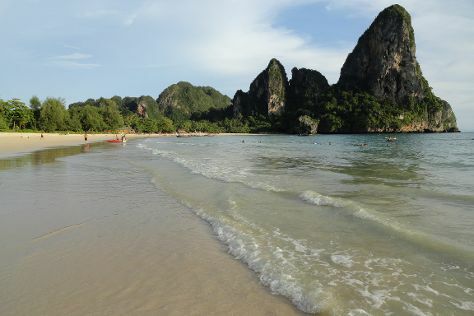 In January in Krabi Town, expect temperatures between 89°F during the day and 72°F at night. Wrap up your sightseeing on the 18th (Wed) early enough to drive to Patong. Kick off your visit on the 18th (Wed): kick back and relax at Patong Beach, enjoy the sand and surf at Freedom Beach, and then tour the pleasant surroundings at Karon Beach. On the next day, get great views at Karon View Point, then enjoy the sand and surf at Kata Beach, then make a trip to Bangla Road, and finally see some colorful creatures with a scuba or snorkeling tour. To find where to stay, photos, and other tourist information, refer to the Patong travel planner. Drive from Krabi Town to Patong in 3 hours. Alternatively, you can drive; or do a combination of bus, ferry, and taxi. In January, plan for daily highs up to 89°F, and evening lows to 73°F. Finish up your sightseeing early on the 20th (Fri) so you can travel to Ko Phi Phi Don. Kick off your visit on the 20th (Fri): contemplate the waterfront views at Maya Bay, enjoy the sand and surf at Monkey Beach, and then enjoy the sand and surf at Laem Tong Bay. Get ready for a full day of sightseeing on the 21st (Sat): see some colorful creatures with a scuba or snorkeling tour, then enjoy the sand and surf at Ao Ton Sai, and then don't miss a visit to Koh Phi Phi Viewpoint. To find reviews, other places to visit, and tourist information, read Ko Phi Phi Don trip planner. You can do a combination of taxi and ferry from Patong to Ko Phi Phi Don in 2.5 hours. In January, daily temperatures in Ko Phi Phi Don can reach 89°F, while at night they dip to 72°F. Finish your sightseeing early on the 21st (Sat) so you can ride a ferry to Ko Lanta. You'll enjoy a bit of beach vacationing at Long Beach and Khlong Khong Beach. Get in touch with nature at Scuba & Snorkeling and Khlong Dao Beach. Next up on the itinerary: identify plant and animal life at Lanta Animal Welfare, enjoy the sand and surf at Kantiang Bay, and stroll through Lanta Klong Nin Beach. To find traveler tips, reviews, maps, and tourist information, read our Ko Lanta vacation builder. You can ride a ferry from Ko Phi Phi Don to Ko Lanta in 1.5 hours. In January, daytime highs in Ko Lanta are 89°F, while nighttime lows are 72°F. Wrap up your sightseeing on the 24th (Tue) early enough to travel back home.